Today there are so many choices for Outer Banks Pool Companies in North Carolina. How do you decide what Outer Banks pool company to use? Here is a list of things to look out for when making your decision on what Pool Company you are going to use. We Have about 175 pool service customers! What!?! So you have so many customers you don’t even know how many customers you have? How can they promise you great service? At Barefoot Pool Service we know exactly how many customers we have. We treat our customers property as if it was are own. We understand that repeat business is the only way to go and your rental property is no different. 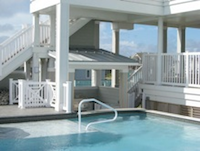 Let us show you how Barefoot Pool Service can be your go to Outer Banks Pool Company. Don’t be fooled by other Outer Banks Pool Companies. We are a reliable and affordable pool service company that has you and your properties best interest in mind.